This week’s Blog of the Week is Peppermint Patcher. 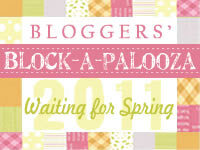 This blog is authored by a very, very talented Quilt Designer who has been published in many magazines. If you go to this blog you will be treated to a miriad of beautiful quilts and all sorts of inspiration. The quilts are bright, colourful and very very fun to make and to stare at. All of the quilts designed by Peppermint Patcher can be found in the Peppermint Patcher Etsy Shop which you will find the link for on the blog. The latest news on this blog is a coming exhibition of all the quilts made and designed by Peppermint Patcher, which is very exciting. So click on the link above or on the blogroll to the right to find out all about it. I know I’m always inspired everytime I go there. I’m all ablush at your kind words. Thank you. that’s lovely! very true though.